This badge was issued to DIMITRIS FINTZOS-VAVLIS on 17 Feb 2017. 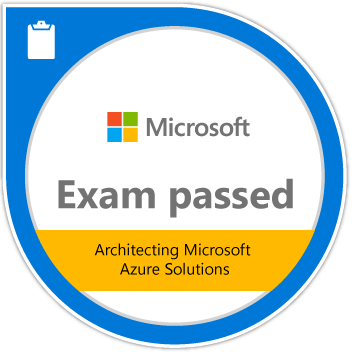 This exam is for candidates who are interested in validating their Microsoft Azure solution design skills. Passing this exam validates a candidate’s ability to identify tradeoffs and make decisions for designing public and hybrid cloud solutions. Earners of this badge are able to define the appropriate infrastructure and platform solutions to meet the required functional, operational, and deployment requirements through the solution lifecycle.